When it comes to charging sales tax, online sellers should start by looking at their home state and determining: whether you are based in an origin-based sales tax state or a destination-based sales tax state. This is key to knowing how much sales tax you should charge your customers. And it can get confusing! It doesn’t help that states make a distinction between whether you are based in a state or based out-of-state but have sales tax nexus within their state. How much sales tax should I charge to buyers in my home state, and at what rates? Do I charge the same rate for every customer? Am I supposed to charge a rate based on where the customer is located? How much sales tax should I charge to buyers in states where I am considered a “remote seller”? Understanding sales tax rates can be tricky. But there’s one quick way to help you begin to understand what you should be charging your customers. The first thing you need to do is find out if you run your business out of an origin-based state or a destination-based state. In origin-based states, sales tax should be collected based on where you, the seller, are located. Let’s say, for example, you live and/or sell out of Carlisle Pennsylvania. Since Pennsylvania is an origin-based state, you charge all customers located in PA the same sales tax rate (6 percent) no matter where they live. If you live and/or sell out of Philadelphia, you’re required to charge that same 6 percent PLUS a local tax of 2 percent to all of your customers in PA. Here are all of the origin-based states. If you live in one of these states, you should be charging everyone in your state the rate for where your business is located. That rate could include a combination of state, county, city, and district tax rates. * California is unique. It’s a modified origin state where state, county and city taxes are based on the origin, but district taxes are based on the destination (the buyer). Here’s an example. Let’s say you live and/or sell in Columbia, South Carolina. You sell a taxable product to a customer in Chesterfield, SC. According to the State of South Carolina Department of Revenue, you are required to charge that customer 8% sales tax. That 8% is the sum of the state rate of 6% PLUS a 2% local tax. Here are all of the destination-based states. If you live in one of these states, you should be charging everyone in your state the rate where the item is being delivered. That could include a combination of state, county, city, and district tax rates. For you visual learners out there, here’s a map that shows the states. Remember, use this map to determine if the state you are based in is an origin or destination based sales tax state. But hold up! If you have sales tax nexus in multiple states, there’s more to the story. Rule of thumb: States treat in-state sellers and remote sellers differently. Most of the time, if you are considered a “remote seller” in a state, that state wants you to charge the sales tax rate at your buyer’s destination. Some states allow out-of-state retailers to charge a flat use tax rate. Contact the state’s department of revenue if you have questions about what rate to charge. 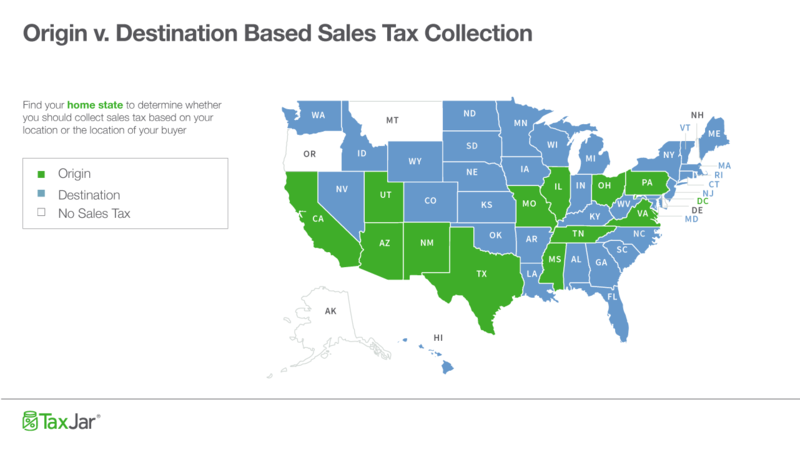 Here’s a map summing up origin v. destination-based sales tax collection for remote sellers. Remember to only use this map to find out which sales tax rate you should charge in states where you have sales tax nexus but are considered a remote seller. Summary: What Sales Tax Rate Should I Charge? As an online seller, the first trick to sales tax compliance in your home-base state is to determine if your state is an origin-based (charge at the rate of the seller’s location) or destination-based (charge at the rate of the buyer’s location) state. 1.) From which customers do I have to collect sales tax? Just customers in my state? Or multiple states? You are required to collect sales tax from customers in states where you have sales tax nexus. Nexus means “a connection or tie” and can be established by having a presence in a state due to an office, store, warehouse or other presence (including working from your home), an employee, contractor or sales person, an affiliate, economic nexus, or storing goods in a warehouse. If you have nexus in a state, you must collect sales tax from all buyers in that state. Some online sellers will have sales tax nexus in multiple states. 2.) I think I was erroneously charged sales tax. Why could that be? – Businesses are required to charge sales tax in states where they have sales tax nexus (i.e. presence.) So this is one reason why you may be charged sales tax. Also, sales tax is based on a the ship-to address. So if you live in a state with no sales tax, but order something for your nephew in a state that does have sales tax, you may be charged sales tax based on the sales tax rate at the address where you ship the item. Those are just a couple of reasons why you may be charged sales tax when you weren’t expecting it. If you are a consumer with questions about sales tax, check out our Consumer’s Guide to Sales Tax here. 3.) I was charged sales tax on the shipping charges on my online order. Why is this? – This depends on state laws. Some states require merchants to charge sales tax on shipping and handling charges, others don’t. Others require merchants to charge sales tax on shipping and handling should some conditions be met. You can read more about Sales Tax on Shipping Charges here. 4.) I sell on Amazon FBA. In which states do I need to collect sales tax? Amazon FBA sellers have to deal with sales tax nexus in their home states and in remote states. Because they have an especially tricky time of it, we’ve put together a guide to sales tax for Amazon FBA sellers. This guide even includes the exact sales tax settings you should use in Amazon Seller Central. Download Sales Tax 101 for Amazon FBA Sellers now. Have any questions or comments about sales tax sourcing rules or how much sales tax to collect? Let us know in the comment section below. Does the origin-based sales tax apply to all sales, or just onlie/e-commerce sales? Everything I read about it refers to internet sellers, but I can’t find whether it applies to all other sales aswell. Hi – for this post we really focused on tax collection for online businesses (our customers). Each of the states provides a decent amount of documentation and support help. I’d call the state if you have a different type of business and have questions. What if the buyer is shipping to a different location? Please clarify “destination”. To me that means “Ship-To”. Yet your text implies its where the buyer lives. Hi Brad – thanks for asking for clarification. You’re correct. The ship-to address is what matters. Will make that clearer. What about out-of-state? I can’t find information about that anywhere. Our business is located in Illinois and has had equipment delivered and installed on our property by a business located in Missouri (which has no presence in IL). Would this be IL- Use tax or be the vendor’s local MO Sales tax? In general, you’re not required to collect sales tax on items sent out-of-state unless you have nexus in that state where you;re sending the taxable item. As for your example, without knowing more specifics it sounds like you’d owe MO use tax IF your vendor did not charge you sales tax. Okay, So I’m Located in Texas. Would I have to charge Sales Tax only to Texas Residents, and be able to sell items Tax Free if I sell/ship to clients that are out of state? I got a 404 error when I clicked that link but I appreciate your advice. Just so I’m clear, Taxing Texas residents means I also have to Tax the shipping as well? But that’s correct, Texas considers shipping taxable so if you have sales tax nexus in TX, you’d charge sales tax on the shipping charges you charge to customers in TX. Thanks for this article Mark. What if I have multiple locations in an Origin-based state, each with a different rate. Which rate should I charge my in-state purchases? Short answer is it depends on the state. In general, states will say each of those locations are separate entities and each charges its own rate (based on where it’s located). Best if you double check with the state to make sure you;re handling it correctly. Very useful info! Here’s a question for you- if my business is established in a destination state but I can be hired to perform services for clients outside of the state, what kind of tax would be applied to the final sale? I’m a traveling stylist and give service in Connecticut but also in NY and MA, etc. Good question. The best answer I can give you is it depends on those states you’re travelling to…do they consider your service taxable? I would contact each of them and ask. What if my business is in Colorado but I ship my products out of California? Do I only charge sales tax to those in Colorado? Keep in mind I don’t know anything about your business other than what you wrote above. But if you have inventory stored in CA or you’re using a fulfillment service in CA then you most likely have nexus in CA. If you have nexus in CA then you would have to collect sales tax on orders mailed to both NV and CA. I suggest you contact a tax professional. We are a manufacturing company located in CA. We ship our products all over the world. But I think there is some confusion within our company. Let’s say our customer is located in California and they want us to ship it to NY would we charge the customer sales tax since they are based in CA? Our customer is located in NY and want us (living in CA) to ship to a third party and are located in CA as well. Would we then charge them sales tax , since the 3rd party company is located in CA? Hi – The general rule of thumb for other states is to charge sales tax only in the states in which you have nexus. If you don’t have nexus anywhere else, then you wouldn’t be required to collect sales tax in other states. I work for a small business in CA that ships products worldwide. This is a 2 partner practice and one partner just moved to CO and is now manufacturing and shipping products from CO but I am handling all the bookkeeping/sales from our CA office where the other partner remains. All AP and AR come from our CA office, only the product is shipped from CO to our customers. Should we be charging the CO sales tax or stay with the CA sales tax? We also do consulting and other services from our CA office which we still follow CA tax rules for. It seems odd to charge CO sales tax when all our addresses on the invoices state we are located in CA and they are sending payment to our CA office. No bookkeeping/invoicing of any kind happens in CO but products are shipped from there and ordered from our guy there. If you have any doubts at all, I recommend speaking with a tax professional with an expertise on nexus issues. Or call the state of CO.
From what you’ve posted, it seems like you should be complying with sales tax law in CO and CA. Most states consider an employee, a place of business, or inventory sufficient reason for compliance. Since you have all three I would think that would be more than enough for CO to consider you to have nexus in the state. Fantastic, that is what we have been doing. Thank you for the swift reply! Mark… I see this question but in scrolling down see no response… I have the same question… live in Oregon… sell via Internet… tax or no-tax? No need to collect tax in OR, but you would need to collect tax from any customers who are located in states you have nexus. If you have nexus in another state, then you’re required to collect sales tax on sales to that state (assuming it has sales tax). The fact that you’re based in a state with no sales tax doesn’t give you immunity to other states. So if we have no nexus in another state and our ecommerce business is in Oregon (a no sales tax state), we don’t have to charge sales tax to the state we are shipping? I live in Oregon and have a small business I run out of my garage selling stationary. That’s it, no other location. Do I need to charge my customer’s any tax? So far, I haven’t been. Because you’re in Oregon, you’re not required to collect sales tax on items shipped to customers in Oregon. You are, however, required to collect tax on taxable items sent to folks in other states IF you have nexus in those states. Hi Mark, Thanks for the informative article. This is similar to my situation, where I live in and operate solely from a no tax state. I think the clarification / confirmation I need is on the term nexus. I believe a nexus to be a location where I have an employee or other physical presence such as an office or warehouse. Since my entire business all physical locations and employees are based in a no tax state any products sold online to people outside of that no tax state should not have to be taxed as the business has no nexus’ in any other state. Please confirm that my understanding of nexus is accurate. If you don’t have any nexus in a state with a sales tax then it sounds like you won’t need to charge sales tax. Of course, it’s up to you to make your own business decisions. I hope this info helps! Thank you for those links. They helped clarify my question. Recently ordered a product from a California based company. I live in Allegheny County where Pittsburgh is located (6% state+1%county). I was charged sales tax for Philadelphia county which is (6% state+ 2% county). I am thoroughly confused as to whether or not this is accurate. The customer service rep I spoke to also had no clue. It’s hard to say without knowing more about the parties involved than what was provided. It’s possible that the company you bought from has a presence in PA country. In that case I could see them charging that rate to all of their customers in PA. Bottom line: the company that charged you sales tax should be able to explain why they are charging you at that rate. I asked if they had any offices or anything in Pa. They said they’re solely in Cali. I also couldnt figure out why it was the Philadelphia county tax that was added rather than the Allegheny county tax if anything other than the flat 6% state tax. We have a business in CA. We re-sell parts from our manufacturer to our customers. We collect sales tax from our CA based customers. Our manufacturer is requesting that we pay sales tax on parts we re-sell to a customer we send parts to in Louisiana. The customer’s corporate office where they pay the bills is in CA, but the factory the parts ship to is in LA. Still, we have no presence in LA, so why should we pay sales tax? Thank you! Hi DP. It’s hard for me to give answers on specific scenarios like this without knowing the full story. I’d run this by a nexus expert. Sylvia Dion is outstanding at issues like this. http://www.sylviadioncpa.com/ Hope that helps. Without knowing anything about your business or the transaction, in general you would not collect sales tax on that transaction unless your business has nexus in CA. Nexus can be caused by an employee in CA, salesperson, a physical location, or inventory stored in a warehouse. How do you file with a state that has different rates per county? I live in CO and am ordering products from Sierra Trading Post and they were recently acquired by TJX so they must now tax my purchases. That’s fine. Do they tax shipping as well as the products I am ordering? The company I work for is based in KY but we are having a booth at a festival in IL, we use IL sales tax correct? If we do charge IL sales tax, how do I go about paying IL the tax? And I am going to bet that IL has different sales tax depending on what part of the state you’re in? If you’re going to collect sales tax then you would collect based on IL rates, not KY rates. To pay IL, you’d need to register for a sales tax license in IL. IL’s rates are based on where you the seller is located. And it’s possible that rate can vary depending on your location. I am a promotional products distributor in Texas. I have a client in Florida. Our supplier is charging us sales tax because they are based in Florida, where we are in Texas (and have never been charged sales tax from a Florida company before). Aren’t we their customer, and our resale certificate should suffice? It’s really hard to say for sure without knowing all of the specifics, so ultimately you should contact a nexus expert if you have any doubts. Or just ask your supplier why they’re charging you. I also work for a promotional products company and we’ve had this happen a few times. We were told that if the order originated from Florida and also shipped to Florida then they have to charge tax. I’m not sure if this is a new law or what because I can only remember this happening in recent months, and our company has been in business almost 40 years. I am looking at an invoice right now where we’ve been charged CA sales tax because the order was drop shipped there, so it just seems wrong that we have to pay CA tax just because of the final destination of the products when we as the seller and the customer/buyer are both in SC. Their rate is 3.5% higher than ours BTW. The whole system is just a ridiculous complicated mess if you ask me! Is shipping taxable by city and local jurisdictions for sales tax purposes? I know it is by the state but can’t figure out the rest. I live in NY. I work for a company in CA. We do not have “nexus” in NY. Our customers order computer equipment and peripheral devices from us. We do not keep inventory. We order from our supplier, our supplier drop ships to the customer. We have a CA resale certificate on file with our supplier. Why are we being charged sales tax on our purchase from the supplier? We do not charge sales tax to our customer in NY. The easiest way to find out is to ask your supplier. We are a manufacturing company in GA that has a sales rep in Illinois. The products are shipped from GA to the buyer in Illinois. Since Illinois is an origin based state do we charge sales tax on the sales rep location in Illinois even though the product comes from GA? Or is the origin based only for intrastate sales? Based on what you’re telling me, the state would want you to collect on interstate sales to IL based on the destination of the item. So if we have no nexuses in any other states we would not have to collect sales tax for those states? We are based in MN and ship around the US. Trying to make sure we are not screwing up anywhere. From what I am reading we don’t have to collect MN sales tax for sales made to out of state customers correct? We are a small company that provides repair services to motorcycle engines. Our customers are located throughout the USA, Canada, Mexico and other countries. My question relates to the purchase of products that our company will be using in the service of repairing the customer’s engine that is not in the state that our company resides. Are the products that we purchase for in the service of the customers engines taxed or exempt from tax? 95% of our customers are out of state. Greatly appreciate any information on this. The short answer is it depends on the actual products you’re buying as well as what state you’re in. Each state treats product taxability differently. If you don’t have nexus in a state then you don’t have to collect sales tax in that state. IF what you’re selling is tax exempt in PA, then you don’t have to collect sales tax. Just make sure with the state that seasoning is considered food. If you have nexus in NY and CA, you’ll also have to check with them to find out of what you’re selling is taxable. If it is then you will be required to collect sales tax on items shipped to those states. New business registered in FL. Product manufactured in TN, shipped to warehouse in NV then out to customers via website and amazon store. Who pays tax? I have a good one for you. I am an Oregon business and I am buying boxes for my hair care product line that is being filled in California. The boxing company (located in CA) is delivering my boxes to my filler in California. However, my filled bottles are delivered to me in Oregon, before any sales take place. The boxing company is saying I must pay tax even though no sales are taking place in the state of CA. FYI…my filler has a CA resale license. Hi, I think I have figuring out Nexus down but I want to make sure I have this correct. I have 3 dropshippers, all located within 3 separate states (California, Florida, and Michigan). The states they are in, I have to charge taxes for the residents that live there that purchase a product coming from the dropshipper in their state. So some products need to be charged tax for a certain state while others need to be charged tax from another state. For example, Product A is located in Florida; therefore, only Florida residents would be charged tax for the product located in Florida. A resident that lives in Illinois wouldn’t pay tax since the product is located in Florida. That part seems to be okay with understanding. Now my question is, since I have drop shippers in 3 different states, does that mean if any person is living in either 3 of those states, no matter which state the product comes from, do they have to charged tax based on their home state or is it only the state the live in that the product is also coming from? I’m working with Shopify in specifying taxes and they told me this but I don’t feel it’s correct: “For any fulfillment centre you have in any state, customers from that state will be charged taxes on the order regardless if the products they’re buying are actually fulfilled from that state. So if you had a fulfillment centre in Florida, California and New York and a customer was ordering from Florida, but was only ordering products that the centres in California and New York fulfill, their order still sees the state’s taxable rate on the cart.” Thanks in advance! I’ve just created a website and am selling handmade jewerly in Mississippi, & just don’t want to get a letter in the mail one day saying I owe a bunch of money regarding taxes that I’ve done wrong. So after registering my business and charging 7% sales tax, am I free to continue? As I’m sure you can appreciate, it’s hard for me to comment based on the info you provides. That being said, getting registered with the state is the right first step if you are selling taxable goods to customers in your state, or any state you have nexus. I always recommend to folks who are drop shipping that they get professional advice before they do anything. The level of complexity is just so much higher than non-drop ship scenarios. Thanks! I will contact one of the professionals you all recommend tomorrow when they are open! Please tell me how should I proceed in order to be invoiced without taxes. Whether or not you are charged sales tax depends on the seller. If that seller has sales tax nexus in California and your item is shipped to California, then they must charge you sales tax, regardless of where you yourself live. Now, we’re not accountants so there could be an exception to this if you can get some kind of sales tax exemption paperwork, but without any proof that you’re exempt from sales tax, most sellers wont’ want to risk getting in trouble for not charging you sales tax. This is a helpful answer. This is a complicated one and I recommend you contact a sales tax professional. I don’t want to speculate too much, and it would be better safe than sorry to get an accountant tell you if and/or why you are liable for sales tax or if there’s any paperwork you need to show to prove you are not liable. We have a service biz in Indiana and sell parts and do service in other states, so would I have to collect sales tax for shipping outside of indiana? You only have to collect sales tax in states where you have sales tax nexus (i.e. significant presence.) If you don’t have nexus, then you don’t have to collect sales tax. But if you think you might have nexus (a warehouse, employee, van, sales person, store, etc.) then you may want to check with an accountant. Hello, I forgot to say that ADP locates GA.
We have product we produce in Canada and then ship to our US facility in Utah. This product is then sold within the US online to customers via Amazon as well as our website. Sold product is shipped from our Utah facility. My understanding then is that we have no Nexus presence anywhere besides Utah and therefore do not need to collect sales taxes for any sales. Is that correct? I am base in Hawaii.. And I am thinking of being a seller, tho I will be using Amazon FBA. If one of my items gets sold, do I have to pay tax on every item sold, even tho my items will be in an Amazon warehouse outside of Hawaii? Still lost… Lets say I own a resale tax certificate for the State of Hawaii. I purchase a piece of equipment in Arizona that I intend to resell to a customer in Hawaii. Am I still required to pay full Arizona sales tax on the item because they are an origin state? Good Morning, I own a manufacturing facilty the makes and retails our own goods here in Michigan. We are starting to grow rather quickly and one of our means of marketing is by hitting up as many expo’s for our goods as we can per year. Word of mouth pretty much. We have a website up and running that has Michigan Sales Tax included on it through PayPal, including shipping as well. My question is, when we travel out of state to an expo to sell our products, do we then have to charge that state’s sales tax or do we remain with our Michigan sales tax? Any advice or where to look is greatly appreciated! I am a musician and will be traveling to other countries. (I live in WA state). What about selling merchandise? CDs, T Shirts and things? Hi Courtney, You shouldn’t have any U.S. sales tax nexus if you are actually making the sale in other countries, but local taxes may apply to you. It’s best to either check with an accountant or with taxing authorities in the countries/areas where you will be selling. In our understanding, if they have nexus in New York, they should generally collect sales tax from customers in that state. Sales tax is complicated, though, and there are sometimes exceptions. That said, some retailers simply don’t understand how to comply, either. I live in PA and own a custom tackle business. I ship to customers in PA and out of state. I know I should be charging tax on my PA customers but what about everyone out of state? Im a small business located in Ohio and deal with Ky based customer coming to my Oh location to pick up product, which makes this an Ohio sale. My question is if the customer has a KY resale certificate can I accept that or do they need an Ohio resale certificate also? You would charge the sales tax of the location where you are. That said, some states are more strict than other on when you need to apply for a sales tax license (or temporary sales tax license) and when you need to collect. Some states want you to collect if you just make one sale within their borders, other require you to be there for a period of time or make a certain amount of money. I recommend checking with each state’s department of revenue as you plan your expo schedule. It sounds to me like this depends on whether the seller in Arizona will accept your resale certificate or not, rather than if Arizona is an origin state. The origin or destination aspect of sales tax doesn’t really factor in that. That said, these posts are intended to provide general information, so I always recommend checking with a reputable accountant for specifics about your business. These blog posts are intended for general information only and I always advise contacting a reputable accountant about your specific business case, but from the facts presented here it sounds like you do only have sales tax nexus in Utah and therefore should just collect sales tax from Utah customers. We are a Michigan company and we ship printing all over the country, we bill a company in PA and a portion of the quantity is shipped in Michigan. Do we need to pay Michigan sales tax on the portion that is shipped in state??? Or no, because the company is located out of state (in PA)?? about Florida tax? Stickers are produced and shipped from New Jersey. That doesn’t sound quite right. If that company has nexus in Pennsylvania, then, no matter where they are located, they need to charge you sales tax. But they would need to charge you a rate in Pennsylvania, not their California rate. It sounds like they may be confused about sales tax collection. We sell out of Colorado. What if the buyer is in Florida, purchases the item, and has it shipped to California? Do we charge the Florida tax rate or the California tax rate? Also, what is the rule for Canada. Specifically in my scenario. If a Canada organization purchases from us but ships it directly to North Dakota (through our shipping). Do we charge them tax for being in Canada or where they are shipping to?? An ecommerce company is based in CT but has nexus in PA or other origin-based states. A customer from PA orders from the company, what should the sales tax be based on; the origin based PA rate because of the nexus or the destination based rate because the company is based in CT? I am a resident of NY state, but work in PA where I would like to start a side business (vending). I assume I will have to set up the business as being based in NY state. Is this possible, or would I have to become a resident of the state where I wish to actually operate? This can be very confusing. But you would charge sales tax at the Pennsylvania rate. And since Pennsylvania is a destination-based state for remote seller, you should charge the rate at your buyer’s location. Well, first it depends on if you have sales tax nexus in California. If you don’t, then you don’t need to charge sales tax there. But from our understanding, sales tax is always charged based on the ship to state, not the buyer’s payment address. The same goes for North Dakota. If you have sales tax nexus there, you must charge the ND rate, but if you don’t, then you don’t need to charges sales tax on that purchase. I highly recommend consulting an accountant on specific questions. We’re not CPAs, so can only deal in generalities and can’t give you advice specific to your situation. For Origin Based States….For customers that live in your state but are having the item shipped to another state or vice versa ( Live in another state but having the item shipped to your Company nexus state ) Do you charge tax on the address for the customer or the just where item is being shipped ? From our understanding, you’d charge on the ship to address. Hmmm. This is interesting. Thanks for letting us know and keep us posted! Hi Ajax, This is more about your business entity than sales tax, so we can’t give you a good answer. I highly recommend contacting a local CPA who can help you decide the best way to proceed. Hello I have created a ecommerce website based out of georgia. I am confused on which states I charge sale tax to and what the % is for that state. I work from home. no warehouse or anything. Most of my customers are out of state. If you only operate out of Georgia and don’t have a significant presence anywhere else, then you likely only have to register for a Georgia sales tax permit and charge sales tax to your Georgia customers. It’s a quick read that will answer a lot of your questions. Good luck with your business! We live in an “Origin-based” state. My husband is an actor in a nationally traveling show. When we sell product after the shows, do we consider our business located in that spot or do we consider our business in our home state? We’re also trying to find these thresholds for each state (harder than it sounds!) and plan to post a blog post about it to make everyone’s life just a little easier! Oh my GOD this is making me rethink my desire to sell my art. Ok, I’d REALLY appreciate some help here. I live in San Antonio, Tx and will ONLY be selling from my residence as I have no need (as of yet) to open a warehouse or sell through someone like Amazon. So as I understand, my ONLY nexus point will be Texas. So what I know for sure so far is that I’ll need to charge my Texas customers taxes. I got that down (even though I’m still not sure how much…but I’m sure I’ll find that out when I get my permit). What I don’t understand is this: since I wont have a nexus anywhere else, do I need to charge taxes to anyone living outside of Texas? If you’re about to tell me that I DO need to charge other people, then my question then will be who? Furthermore, will I need to get permits in those states too? Ok, That’s comforting. I have a few more questions then if you don’t mind helping. 1) Since I only have to charge taxes for Texas residents, does that mean I can re-open my shop and sell only to Out-Of-State customers, or do I have to still wait until I get my Texas Tax permits? If I don’t have to charge any taxes to someone living in the rest of the country, I would imagine that it wouldn’t matter. 2) Independent of the previous question, since shipping is taxable, do I charge shipping tax on everything or again, just Texas residents. I’m unclear on this aspect mostly due to the fact that it’s commerce that will be traveling via taxable routes to get out of the state. 3) Lastly, I understand the state tax now. The next part will be county and city. I live in and am registering my business in Bexar County/San Antonio. The question is in regards to county and city taxes. Does origin tax still apply here? Will I be needing to charge taxes only to Bexar/SA residents or will I need to figure out tax rates for every county and city in the state? If the latter, I’m going to have to enter possibly hundreds of thousands of different, constantly changing tax rates into my shop-portal on my website. This seems unnecessarily burdensome. Thank you SOOOOOOOO much for your help. It really is helping me to get my fledgling business off the ground. You help has already slashed half my work by explaining that I only need to worry about Texas right now. And you’re giving all of us this information freely without charging. I can’t express enough my gratitude for your help. In addition to my reply, I just had another thought. Would the shipping tax change any if I ship through FedEx? I imagine they have nexus points all over. I have a question? An Online Business Store Based ONLY in California just recently started charging ALL their Customers in Every State Tax. Are they allowed to Charge me Tax when I am in NY when they Only have a Store in CA? Several Customers from other states pointed this out yet the store continues to do this? Is this legal what they are doing? My business has a 3rd party manufacturer making custom products in North Carolina (a destination based state for sales tax), my customer (an out-of-state company) will pick-up the material with their shipper fo transport the material for use in another state, either FL or NY. Where is the sales tax liability, in North Carolina or FL/NY or is the sales tax non-existent?? I am assisting in a start up that will be selling at various shows around the state of CA right now but there could be a branching out to nearby states. There is a permanent business location, but obviously sales will be occurring all over the place. Is sales tax calculated based on location of the sale? or the office address. Sales tax is generally assessed on the point of sale when in person. If you branch into other states, be sure to contact their Departments of Revenue to find out what kind of sales tax licensing they require. We can’t go into specifics about your situation because we’re not accountants, so I recommend contacting a CPA to make sure all of your ducks are in a row. Good luck in your business! 2.) Just Texas. It sounds like you don’t have nexus to charge sales tax on shipping anywhere else. 3.) Since Texas is an origin-based state, you only charge sales tax at your business location. There are lots of reasons why they may be doing this. They may have affiliates in all states, or be planning an expansion and working something out with each state. Also, many states are happy to receive sales tax revenue from out-of-state sellers who voluntarily want to collect. If you’re concerned, you could contact your state’s department of revenue and find out if they have a sales tax permit. Hello, I live in NY state which I understand is destination-based. Does that mean that if I sell to someone in California that I charge CA sales tax? Or do I only apply sales tax to people I sell to in NY? Thanks. My company is located in Orange County, CA. We sell equipment to a company that is based in Rhode Island but the customer has facilities in almost every state (including CA). The customer’s billing address is RI but we ship the equipment all over the US. Are these sales all taxable? If so, what tax rate(s) should we charge for these transactions? From our understanding, sales tax is based on the ship to address. If only only have nexus in California and ship to Rhode Island, you wouldn’t need to charge sales tax. I live In Nevada, Las Vegas to be exact. I order on occassion from a company based in New York. Never paid tax when I ordered. Last year, July, they opened a branch or warehouse in Sparks, Nevada. When that happened I started getting charged Sales Tax. One, how do I know that when I order I’m actually ordering products from the Sparks warehouse? Two, their sites say some things are in New York, some are in Sparks, when stock is out in one place, it comes from the other. Yeah? Well how do I know that? I looked at shipping, Ground, $18 … 3 day $22, so that means if I order and I pick 3 day then my order should be here within 3 days. THREE days from Sparks Nv to me? I don’t think so. So I write them about the tax thing and the shipping and this is what they said: “Since we do have a facility in NV, and you live in NV, you will be charged sales tax whether the order ships from our NY warehouse or NV warehouse. Both of these items are currently only located in our NY warehouse, so your order will ship in 1-2 business days, and will be in transit for 5 business days.” This is really ridiculous. If my purchase is made TO New York and shipment is coming FROM New York why all of the sudden am I paying taxes? Forget about the 3 day shipping. If I pay for 3 day shipping, no way am I letting them get away with 5 day transit!!!!!!! The company is right. If they have sales tax nexus in Nevada, they must charge sales tax to ALL Nevada customers regardless from where the order ships. I hope this has helped clear up any confusion! I’ve been charged sales tax, by Apple & by a Flower delivery business. I live in Oregon, made my purchase while sitting in my home in Oregon. But in both cases the items were going to people in New York City. This is different from the posts below, in that residents of the sales tax state weren’t the purchasers, only the recipients of my Oregon purchase. The flowers business insisted on charging me because they had a physical presence in NY state. But I, the purchaser, am making my purchase in Oregon. Should I be charged tax? I live in sales tax-free Oregon. When I shop on the internet, am I not making purchases from my home in Oregon, so not liable for sales tax? If I make an internet purchase and then have it shipped to people in NYC (gift-shopping), why am I getting charged sales tax? I bought in Oregon, it’s only getting shipped to another state. I understand destination states in context of people getting charged the sales tax of the place where they reside. If the people I bought gifts for were to have ordered the items themselves, then of course they would be charged sales tax. But how does this apply to my purchases? at first I thought I hadn’t hit the post button, and re-wrote my post, making sure to submit it. I came back later, refreshed the page and it’s gone. I tried sorting by newest and there’s a post from 9 days ago, but mine is missing. ? Was it something I said? Hi there, Most likely the reason this happened is because sales tax is charged based on the ship to location and not the billing location. We agree that sales tax can be extremely frustrating. I hope this has helped shed some light. Is that a legal requirement of some states, or a business choice? You’re right, this is confusing! I thought Oregon would be the point of sale. Our posts are set to be approved by an admin and we just approved yours now. Sorry about the confusion! We are small distributor in Minnesota who purchased a product from a vendor in Utah and they in turn shipped it to our customer in California. They sent us the bill and charged us the sales tax for California…this doesn’t seem right. We are in Minnesota. The accounts payable contact is telling me because they shipped it to California they have to charge us tax…But again we are in Minnesota and we are his customer, no matter where we had him ship right? Can you help? I’ve spent way more time researching this than it was worth and the only thing I find is some seller on some forum saying that as of 2013, CA sellers do indeed have to do this. Seems doubtful but I wanted to check with you; It’s hard to tell when articles on the web were written – is there such a CA law dating from a couple of years back, or can I proceed in asking him to refund the tax I paid (I had to go ahead with the purchase before I got his answer). From our understanding, sellers only have to charge sales tax to buyer in states where they have sales tax nexus. So this seller, if he only has nexus in California, would only have to charge sales tax to buyers in California. It does sound like you should not have paid sales tax. I hope this helps! Thanks so much. I figured if there had been such an unusual, blanket law imposed in California in 2013, you would know about it! I live on the AL/GA border. I live in Alabama and would be selling items out of my home, and if I set up permanent storage/office space I understand it would need to also be in AL. However, because of the geographical oddity that is our state-line-split metropolitan area, I would (potentially almost exclusively) be selling to customers in GA, and would be physically delivering their items, or haivng them pick up in AL. Would I still charge my local AL tax (as if my home is a brick and mortar store and I’m just delivering, like pizza), or do I charge them GA tax, or do I not charge tax at all on that purchase? I’m a buyer in Thailand, I purchase items from the US. I have all my order’s ship to our freight console in CA before shipping them straight to Thailand’. The shipment is a routed transaction final destination is Thailand. Do vendor in the US still have to charge us in Thailand for Tax? because I been getting charge from a vendor and I’m confuse. They are asking for a resale certificate so they won’t charge us for tax, but I don’t know how to obtain one here in Thailand. The seller has probably been advised to charge you sales tax since your items are shipped to California. You may want to contact a sales tax expert to get this straightened out. Sylvia Dion of http://www.sylviadioncpa. specializes in international sales tax and is a good one to contact. Good luck getting this straightened out! I recommend you contact a CPA because the delivery thing is where you might get in trouble. For the most part, if you were making sales at your home then you would charge sales tax at the point of sale (Alabama, your zip code) but the delivery-into-Georgia issue is where you’re going to get nexus in Georgia and perhaps experience some problems regarding destination-based sales tax. I recommend contacting one of them to make sure you are doing the right thing. You can also run this issue by the Georgia and Alabama Departments of Revenue, but be sure they send you their ruling in writing. What if I sell a ticket on stubhub.com? Stubhub won’t tell me where the customer is located. Is the ticket “delivered” to stubhub in california? If my sales rep hand delivers some product over the state line to the customer, does that mean that I now have tax nexus in that state because he was there at the point of sale? Hi BRL, We’ve gotten a couple of questions about StubHub at this point, but aren’t sure how this works since you don’t know where your customer is located. I plan on researching this and writing a future blog post about it. I’ll post here when we’ve figured that one out. Until then, I might suggest contacting StubHub to ask them what you need to do about sales tax. I’m sorry we can’t be of service now, but I will put this on my short list of future posts. Any updates here? I’m very interested in how a service (like StubHub) is seen in the eyes of the tax laws. I actually contacted StubHub a long while back and their answer wasn’t satisfactory at all. I’m going to have to continue to dig. Thank you for letting me know your continued interest! Hi, my company is an online auction. I have a seller located in the County of Los Angeles who does not ship anything. The buyer has the option of picking it up locally or arranging for a third party freight carrier to pick the item up on their behalf. In my opinion, since my seller is never the “shipper” ownership is always transferred at the site therefore should be taxed at their location’s rate. Thoughts? Hi, I have an “interesting” scenario… Our company is incorporated in Delaware, owned 50/50 by a Pennsylvania resident and me, a UK citizen. We sell copywriting services and all our business is conducted over email and phone with the final copy emailed to customers who could be in any state. The copy is written and edited by both of us. Any idea if and how sales tax applies to us? Thanks! We are a MD based company with a location in NC. What if a FL customer (who is tax exempt in FL) picks up material from our NC facility. Should we then charge them NC sales tax? You only have to charge sales tax on taxable goods and services in places where you have sales tax nexus (in this case the only place where you have sales tax nexus in Pennsylvania, because Delaware doesn’t have a sales tax.) Services are generally not taxable in Pennsylvania, but if you want to be on the safe side I’d contact a sales tax expert of give a call or email to the Pennsylvania Department of Revenue. I hope this helps! You can also contact the North Carolina Department of Revenue and get their take. Our business is located in Missouri and we are only required to charge sales tax to Missouri customers. We have had some recent confusion though on orders that have been purchased and billed to out-of-state customers but shipped directly from our location to THEIR customers located in Missouri. Are we required to collect tax on a scenario such as this and if so, would it be from our customer or the end user? Hi. Thanks for the great article. However, I am confused with one thing. Why would Tennessee consider “us” as a remote seller in this example? There is no mention of a sales tax nexus in Tennessee, only a warehouse in Virginia with the main business location in Georgia. I understand that Virginia would consider us as a remote seller but I don’t know why we would there be any sales tax for Tennessee? Any explanation regarding this would be very helpful. Oops! My apologies. That was just a mistake. “Tennessee” should read “Virginia.” It’s now fixed! Tax definition of Nexus: When buyer and seller have physical presence in a state boundary. “Physical” isn’t always the right term anymore. Things like affiliate or click-thru nexus have been deemed to still constitute nexus. Now many experts are saying “significant presence.” That’s for better or for worse, of course. We just wish that sales tax could be simplified for small businesses. I live in NY. I bought some Juices in Florida state. They collected taxes..
Companies may have sales tax nexus (and be required to charge sales tax) in multiple states for any number of reasons. They may have employees or contractors there, use a 3rd party affiliate there, etc. Also, states can elect to register with New York and charge sales tax, too. If you think it’s a mistake, you could ask the company why they charged sales tax. I hope this info helps! Question. I work at a store in based in California and it’s usually filled with tourist from all over the county. The other day a customer wanted to buy something but claimed that we didn’t have to charge him sales tax because he was having the item he was going to purchase shipped out of the country and he doesn’t pay sales tax where he’s from. When we told him that in California we charge sales tax no matter what he claimed that new exempt to sales tax especially in California. So I was wondering if any of this is true. News for you to use. Apparently Tennessee is changing to a destination state as of 7/1/2015. Can you confirm that? They just cemented something that they’ve always enforced. Tennessee is origin-based if you are based in Tennessee, and destination-based if you aren’t based in Tennessee. They also give you the option – if you AREN’T based in Tennessee – to charge a 9.25% tax rate. I hope this helps! I am confused. I live in CA and purchase wholesale items and sell retail. Who do I NOT charge for tax? The NO TAX states above? But everyone else gets charged my county/ city tax? Am purchasing in Georgia and having item delivered to residence in North Carolina. Is there any sales tax? You would charge sales tax at the point of sale. It doesn’t matter what he’s going to do with it AFTER the sale. The term “nexus” is a tricky one, I’m finding. Every site I run across where people ask “do I have to collect sales use tax” they are answered with “if you have nexus in that state”. That’s where the issue starts.. the definition of nexus is so loose and different in every state, it’s seems impossible to know which states you have nexus as each company has a different situation (tangible, vs non-tangible, warehouse, presence in the state, employees that travel there, etc). I run a small business out of MN. I have a home office, no other locations, and don’t travel to other states. People come to me (my site) to purchase my software. I asked again if they could tell me what causes this nexus. They obliged by saying “because you sell products to customers in WI”. Well, that’s pretty plain cut. Because a customer came to my site, downloaded my software and purchased a license key from me, I should have been collecting sales/use tax from them. How I should have know this is beyond me, as even my tax accountant didn’t know. What I am trying to find is a list of other states like this. I hear NJ is one. But, I can’t find this list anywhere. It almost feels like right now WI is trying to bully me into paying out of ignorance. I’m all for states rights, but if I have to collect sales tax from customers in other states, I would think there would be one place I could go to find out which states this applies to. I thought I ran across a law somewhere that said states can define nexus their own way, BUT, they must make it “easy” to file and pay these taxes. I would hope “knowing if you have nexus” would be a stipulation too. Now, WI is making me go back to 2009 and up to 2014 and all WI sales are subject to not only sales/use tax, but WI state INCOME tax as well. Customers that paid the sales/use tax (as they should as the burden falls on them FIRST) I can report as paid. But, anyone that didn’t I pay the tax and a penalty. Even if there is one of these years where all the customers paid the sales/use tax and my burden is zero, I personally still have to pay a fine for not filing. For 2015 and up I am required to collect the sales/use tax from WI customer (which is different for each county as well! Talk about a nightmare setting up taxes and tax groups in QB!! Then knowing which one to use!). And, of course, pay WI income tax on WI sales. If this isn’t taxation without representation, I don’t know what is. I’d love to hear from others in the same situation. This one issue with this one state has cost me thousands in penalties, fees (from the state and my accountant for filing the income tax portion) and not to mention countless hours of paperwork. It’s really ridiculous. I’d respectfully tell WI to shove it and avoid travel into that state. I am a customer in VA (an origin based state) purchasing a service, a photographer for a wedding, and the parent company is located in NH (a no tax state). What tax would I pay, if any? The quote I received includes a 7.25% tax. There are no physical offices in my state and the photographer lives in DC. That’s a great question. They may have nexus in Virginia (or whatever state the service will be performed) due to some other reason, or they may simply have elected to collect sales tax there. That said, I’d definitely ask the company why they are charging that tax rate. Sales tax is confusing for businesses. They may have a reason or be confused about what they should charge! We are located in Missouri and sell over the phone to everyone in the USA. So for example, our product/shop is located in Missouri and a customer bought items that we are shipping directly to them in Arkansas. Do we charge them Sales Tax and if so, which states tax gets charged to the Arkansas customer? Hi. I’m selling jewelry at a craft show in NJ but my home business is based out of NY. What tax do I charge and which state to I pay? We are an LLC in Nevada, our products are manufactured and shipped from California direct to customer. All sales are through the internet. Do we charge and pay sales tax in Nevada to customers in Nevada? I am a PA based custom cabinet manufacturer that is quoting a commercial construction project that will include shipping finished materials to the construction site in VA. I was asked by the General Contractor, whose offices are in IL, what the sales tax add would be for my purchase order since I stated in my proposal + Tax if applicable. We have never supplied products or provided labor services to the state of VA before, so I don’t believe that we would have nexus in that state. I believe that I should not be collecting sales tax for that project, however, do believe that the contractor should still be required to pay the state of VA a sales tax for our products based on the delivered price of the products to the job-site. Am I correct in my thinking about this tax issue? I can’t give specific tax advice, but this sounds right to me, too. It doesn’t sound like you’ll have nexus in Virginia. If you did, you’d need to charge the sales tax to the buyer. But, yes, Virginia requires that people who purchase a taxable item in the state but don’t pay sales tax on it pay the use tax back to Virginia. I will be selling candles online and it is a home-based business. I live in NC. Do I need to collect taxes? Thanks! If candles are taxable in NC (and they likely are) then you have sales tax nexus in NC and need to collect sales tax from buyers in NC. You only need to collect sales tax from buyers in states where you have sales tax nexus, so if you are home based, don’t have any employees, warehouses, sales people, etc. in other states then you likely only need to collect NC sales tax. Thank you Mark! Have a great day! A diffetent situation .What about this:I live in OR,no- tax state, but every time I visit CA or WA I have to pay their tax either I stop to eat or purchase something. I usually get a response that a seller has to charge tax to me even thought I am out- of – state customer. I do not believe it is true. Where can I find more info on this so that I would be equipped next time I visit a state that imposed sales tax? Unfortunately they are right. They are required to charge sales tax at the point of sale. Now if you were ordering something online and they shipped it to you in Oregon then you wouldn’t be required to pay sales tax, but if you are standing in California or Washington then you owe the sales tax. What about in the case of a origin-based state such as Texas? Can they charge me in Oregon sales tax? What if I have a drop shipping account set up in Florida and I ship to someone out of Florida. I am aware that Florida is a destination tax so if I ship to someone in the state I have to charge their county sales tax, but for out of state sales what is the requirement. If an Ohio company has a sales office in Nassau County, NYS, and I buy something from that company, and I live in Niagara County, then we should be charged Niagara County, correct? Since we are a destination State? I’m sure this one has been answered before, but if might be buried deep in the comments. If I’m selling on eBay in California to a buyer who lives in California and pays with check / paypal / etc on his California based account, but is buying for a 3rd party with a ship to address on the purchase out of state or out of the country, do I still charge him sales tax? You would charge sales tax at the rate of the ship to address. So if you’re shipping it to the buyer in California then you would charge him sales tax. Hi, I’m sorry if this isn’t the correct discussion or if this has already been answered, but do I need to charge my customers taxes based on product or shipping? I operate out of VA and don’t have a nexus in any other state so I know that I need to charge my customers a VA sales tax rate. I’m using Squarespace to sell my products and it’s asking me to choose whether to charge tax on the product or shipping (or both) and I’m not sure. I appreciate anyone’s help. Thanks! Internet based company in CA only, nothing in other states. Our vendors want to charge us sales tax in FL and a couple other states. The sales reps don’t always know where the shipments are going so if they are going to same state they get mad when they are slapped with sales tax later, and have already quoted their cleints. What’s a good way to avoid this? I’m not 100% sure I understand the question. Whether or not to charge sales tax is up to the individual vendor, but if they are charging you Florida sales tax and you’re not in Florida you can definitely dispute that. Feel free to give me more details! Is SC state tax chargeable on items shipped to Canada? If I order a present for someone who lives in New York City. But I live in the UK. Do they still charge me NY taxes even though I am not a Resident of New York nor Even the Country?? I’m only asking cause this just happened to me. thanks. They will charge you sales tax based on the ship to address of the item. I hope this helps! I am a small Los Angeles California, home based handmade jewelry company selling my handmade jewelry on Etsy.com. Do I need to charge sales tax to every customer including out of state customers? Also, I’m thinking of purchasing their credit card reader that attaches to my cellphone to sell in person as well, would I charge sales tax when using that? It sounds like, as of now, you only have nexus in California so you’d only have to charge sales tax to California customers. Sales tax is charged at the point of sale, so if you are using a credit card reader to make a sale then you’d need to charge sales tax at the rate where you are making the sale. You can calculate this by going to TaxJar.com/mobile or, if you end up using Square, TaxJar integrates with that and you can quickly and easily use geolocation to apply the local sales tax rate where you’re standing by using the TaxJar app with your Square reader. We are based in TX and have a customer from ND ordering material. They are listed as taxable but because they are out of state we dont collect tax BUT they are collecting the material in TX. Do we apply TX sales tax since point of sale ends in TX? Fedex is picking up here and shipping is being billed to their fedex account. Sales tax is generally based on the point of sale, because that’s the point where the inventory is turned over to the customer. For example, if you were shipping the goods to ND then they belong to you until that customer signs for them in ND. Since that point of sale is in a place where you don’t have nexus then you don’t have to charge. (As you know!) So I’d advise to consider where the goods are turned over to the customer. If they’re considering to be turned over to the customer and out of your hands in TX, then you’d charge sales tax. We have dealers who take a ten% commission forward the order. We then install at the customers home and collect the 90% The question is dealer location or customer location for sales tax? There appears to be two different ways nexus is treated in destination states, a state-wide nexus or a local nexus. For places that have a state-wide nexus (Arkansas for example) you would need to collect the destination sales tax if you sent via common carrier (UPS, Fedex, USPS). Other places have a local nexus determination, like Colorado, where you only need to collect local or county sales taxes if you have local nexus in that locality (a single store in Boulder wouldn’t pay Denver sales tax for items sent via common carrier). Do you have a list of which is which anywhere? Mark, you say that Connecticut doesn’t tax services, but CGS Section 12-407 lists a bunch of services subject to tax. Assuming CT does tax services, if a CT consulting business did work for a company in MA, and for company in NY, which state’s tax would apply? What if one member of the company is based in MA? I can only give out generic tax advice, but you only have to charge sales tax in states where you have sales tax nexus. http://taxjar.wpengine.com/sales-tax-nexus-definition/ So if you’re based in Connecticut and ONLY have nexus in Connecticut, you’d only charge sales tax to CT customers. But if you had an employee in MA then you’d have nexus there too (according to MA laws) and then you’d charge sales tax to MA customers as well. I hope this explains it a bit better! Let me know if you have more questions! Thanks Mark. That’s helpful. Keep up the good work. I live in NH (no sales tax) and purchased an item online to be delivered to a friend in Colorado. I was charged a tax. Is this right? I’ve never had to pay a tax from ordering online before even if I have it sent to someone out of state. Thank you. Thanks for the clarification. Very helpful. I’m not sure I really understand the question. Sellers who have sales tax nexus in a state charge you sales tax based on the ship to address. So if you have an item shipped to Texas, they would charge you Texas sales tax. I hope this clarifies! Hi Gregory, We don’t yet but that’s something we’re working on. In the meantime, if you have questions about the sales tax logic in TaxJar, feel free to contact us at support@taxjar.com. Thanks! I have an online business based in Alabama. What if a customer in Florida purchases a gift for a friend who lives in Alabama, and they want me to ship directly to the recipient? The customer is in FL, but the item will be shipped to AL. So would I need to collect AL sales tax from the FL customer? Thanks! I am a new apparel business located in an “origin” state that ships product to customers nationally. Should i be collecting my state sales tax or theirs? But that said, when you have nexus you collect based on the sales tax sourcing laws in that state. For instance, if you only have nexus in an origin based state like Illinois then you would only charge sales tax to Illinois buyers and you would charge it based on the sales tax rate at your location (the origin.) But if you also have sales tax nexus in other states, you would need to look at whether they are origin or destination for remote sellers (most are destination) and then charge sales tax based on that state’s sales tax rates. Let me know if that makes sense! I live in Ohio and want to buy something at an art store in Miami. I will then have them frame it and ship it to my home in Ohio. Does the Ohio or Florida tax rate apply? I have a business that ship refrigeration compressors to walmarts ( for their freezers) in other states. Do i charge them sales tax on these items or not. I do not have any other locations except my plant in tennessee. My nexus is tennessee but walmart has stores in tennessee which i do charge sales tax on their items. I own a repair business and based in PA. I travel to New Jersey to do repairs at one of my customers facilities. What rate of sales tax do I charge for New Jersey customer and do I have to register with the state of NJ to pay that sales tax? That said, sales tax is generally charged at the rate of the point of sale. I can’t give you advice specific to your business but I hope this general info helped! I’m a sole proprietor located in TX and selling in GA,NC and CA. Would I need to collect sales tax if I didn’t have a nexus in that state? Would a 1099 contractor in a state be considered a nexus? If required to collect sales tax would I collect on the rate where the product is shipped since TX is a “destination” state? Do you have to charge sales tax on the shipping and any installation charges? Thank you. I live in Florida and via online, purchased something from a company in Florida and paid sales tax which I understand. The item was shipped from Connecticut, not Florida. Should I have to pay tax? What happened is that the Florida company has sales tax nexus in Florida, so they have to charge you sales tax. It doesn’t matter from where the item was shipped. Hope this helps! Texas is an origin-based state, so you’d charged based on the rate of your ship from location. If I am located in North Carolina and ship an item to a state where we do not have nexus for a customer also located in NC, do we charge sales tax for the freight amount? The sales tax is based on the ship to address. So for example if you sell to someone with a bill address in North Carolina but ship that item to Georgia (a state where you don’t have nexus) then you wouldn’t need to charge sales tax. Your buyer would likely owe use tax on the item. We have an ecommerce website in New Jersey. We drop ship items to other states (Michigan, Penn., Florida foe example) from our Manufacture in Minnesota. Our Manufacture in Minnesota is charging us sales tax at the rate collected in the state too which they shipped the item. .
the higher price which is their cost? Then send the increased tax to our Manufacture in Minnesota? If we only charge the amount our Manufacture charges us then our customer will know what price we purchase the item for. This makes no sense. I am starting a business and the product is an educational guide which I hope finds its way to college students. If I sell to an educational facility, would the tax only be on shipping? If I sell to individual students, I’m under the impression the item would be taxed according to the state where the small guide is sent. Is this correct? Thanks – the article is a great start. We have purchased a log home kit in South Carolina. They will deliver it to our property in New Hampshire which is tax free. Should we have paid a 6% sales tax to this company. It doesn’t sound like it. I’d give them a call or email and be sure they charged you correctly. Sales tax can be confusing for many businesses. We are a manufacturing company in GA that sells to various states. We have a sales representative that regularly goes to AZ so we assume that we have nexus in AZ but we do not have an office there. We have set up an office with a registered agent (Incorp) located in Phoenix. We have been charging and filing sales tax based on the ship to address, though now we have received from the state of AZ a return that only has Phoenix. It was my understanding from previous seminars that we would charge and file based on destination even in origin states if we are out of that state. Which is the correct way to handle this? We file based on ship to address currently in TX, OH and VA.
Good luck getting this straightened out. We totally understand what a bear sales tax can be, especially in remote states! we have a business based in MN, but one of our key employees is based in TX and uses his TX address, are we considered a remote-seller? I sell shipping containers and do not have a brick and mortar physical location and live in Greenville SC. I would consider myslef an e-commerce type business as I sell via online advertisements and conduct business basically via email and cell phone. I purchase the containers out of charleston and sell to SC customers therefore charge 6%.- got it. 2. I also sell to North Carolina customers– how do I handle taxes? 3. I also get containers out of savanah GA and sell to GA customers – How do handle taxes for those sales? Sorry if someone already asked this but I can’t find it. What if you live in Illinois, but travel to another state to participate in markets? Do I need to collect New York sales tax in NYC if I am there for an antique show, for example? And then would I need a reseller license in New York for that? As with many things having to do with sales tax, “it depends.” Here’s a post on trade shows/selling temporarily in other states: http://taxjar.wpengine.com/does-attending-a-trade-show-create-sales-tax-nexus/ I hope this points you in the right direction! If I am a customer in Oregon ordering a book in Utah, do I have to pay sales tax on the order? I have never been charged sales tax before when it is shipped to Oregon, but this company said I owe them sales tax. Is this new? Sales tax is generally charged at the ship to address and since Oregon has no sales tax you generally won’t pay sales tax if you have an item shipped to Oregon. You may want to explain that to the company. Companies have a hard time dealing with sales tax and they simply may not realize this! Thank you. Are there laws or guidelines for interstate selling? I can’t seem to find this info anywhere. I live in Toronto Canada and I have a designer who lives in Hawaii. He claims that he has to charge me his 4% tax on his invoices. I’ve been told that I’m not supposed to be charged the 4% tax. Can he charge me this tax or would I be exempt from this tax? I know when I bill my international clients I never charge my Ontario tax because they are exempt. Does the same thing apply here? Any help is appreciated. Hi Mike, I recommend contacting the Hawaii taxing authority on this one. Press 1 for Touchtone, then 0 for a Representative. While it doesn’t sound like your designer has the nexus to charge you sales tax, HI is a very complicated state and it may be that they’re requiring him to pay the 4% out of his pocket if he doesn’t charge you. This is a state we haven’t delved into yet so I recommend you contact the number above during Hawaii business hours. I know this doesn’t answer your question, but hopefully it points you in the right direction. Thank you very much for the info. I will definitely call them and find out for sure. You are right. I think he must be required to pay the 4% out of pocket as he did mention to me that usually some people charge a bit more for their service to cover the 4% tax. But I will call the tax office to get the details and report back to help others looking for similar info. Much appreciated. Please do report back. Thanks, Mike! Happy New Year. Sorry about the delay in responding to this. Been really busy. I finally called the Hawaii tax office and they clarified everything. Basically if anyone in Hawaii is providing a service to anyone outside of the state of Hawaii, even if the client is in another state in the US, they can’t charge the 4% GET tax to their clients. They can only charge the GET tax of 4% if the service is performed for a client in the same state (Hawaii) only. If the service is done for someone outside of the state, they will need to fill out and sign an export exemption certificate G-61 and keep for their records in case of an audit. That’s all they have to do. Here is the Hawaii technical tax department number in case anyone has any technical questions about Hawaii tax 808-587-1577. I hope this helps anyone else looking for this info. Thank you again for all your help with this. I really appreciate the follow up, Mike. So it sounds like Hawaii is like other states, for the most part. Thanks for the info and the phone number. Cheers! Mark, you’ve been super helpful. I have one question though… We have Nexus (in our case, brick and mortar stores) in several states, and in CA we have multiple stores. We usually ship our eCommerce sales from one state. It looks like we should be charging tax based on the destination in all cases, and not the source for some states, like Missouri. How can I get TaxJar to give me destination based rates for all states? The TaxJar API takes all the complex sourcing rules into account. You can find out more here: http://www.taxjar.com/smartcalcs. Or let us know at support@taxjar.com if you have specific questions! Hi, Mark. Thanks for this article. I do need some clarification please. I opened an online business boutique selling retail that I purchase from wholesale. I’m located in Ohio, an origin based state. According to the article, I will only charge sales tax based on my county rate (6.75%) to purchasers from Ohio, regardless of where they are located within the state. I am not required to charge sales tax to out of state consumers. Is this correct? Thanks so much for your advice! While we always recommend you contact and accountant, that sounds right. Ohio is origin-based, so if you are based in Ohio you’d charge buyers sales tax based on the rate at your location. And if you don’t have sales tax nexus – http://taxjar.wpengine.com/sales-tax-nexus-definition/ – in any other states, then you don’t have to charge sales tax to buyers in other states. I hope this helps with clarity! I have a fast growing company based in Ohio. We currently operate two locations in Florida, a location in NYC and here in Ohio. All purchases ship from our Ohio location. Soo, if someone purchased product in Naples, FL (6%) and has their product shipped to Miami (7%) from our warehouse in Ohio, do they pay 6% or 7%? What if they ship to a county in Florida that we don’t have a nexus? There are a couple of questions here. First, if you have nexus in a state, you have nexus in the entire state and must collect sales tax from all buyers there. Third,when selling online, you always charge sales tax to the buyer’s ship-to location, not their billing location. So for example, you sell to that buyer who has the product shipped in Miami, you’d charge them the 7% Miami rate. This is because you have nexus in Florida, which you’d treat as destination-based and you’re shipping to a place with a 7% sales tax rate. I really hope this helps! If you’re charging sales tax on your own, I also recommend checking out TaxJar’s Sales Tax API here: http://www.taxjar.com/api. We take all those sourcing rules into account so you don’t have to do these puzzles in your head every time you make a sale. Good luck! question on destnation bace sale? From Massachusetts ” middle man that handles the posting and listing of sale in callaforna” to oregon can the vendor use states sales tax to boost the price to the tax price via the middle man or does the middle man need to remove the price; to the add price lissted as. It almost sounds like they are just doing some arbitrage. One seller is buying it from another seller then reselling it for a higher profit. That said, I may not be quit understanding the case. But also, no sales tax shouldn’t be used to to change prices on an item and sales tax should definitely never be pocketed. (I.e. it should always be remitted back to the state.) That’s the kind of thing that can cause big fine and penalties or even criminal charges. I’m not sure I answered your question, but I hope this shed some light. My Client is based in PA and is selling machinery to a company in Illinois. PA sales tax rate is 6%. Should they be charging the customer the 6% PA rate or the 8% Illinois rate? You only need to collect sales tax from buyers in states where you have sales tax nexus. Here’s more about the factors that create nexus: http://taxjar.wpengine.com/sales-tax-nexus-definition But if they do have nexus in Illinois, they should charge the rate at the buyer’s ship to address in Illinois and not the PA rate. I hope this helps! I work for a tire repair shop in Ohio. We do service calls in Ohio, West Virginia and Pennsylvania. As an Ohio based business do we only charge Ohio sales tax or do we base it on the location of the service call? Also, if you did end up having nexus in WV or PA then you’d charge sales tax based on the location of the service, not your Ohio rate. I wish it were that easy, Eric. It’s not. As mentioned in my post I don’t travel for my job (unless I choose to for a consulting gig, but then that would be billed under my LLC, not my S-Corp). All of your state sales tax articles have been amazingly helpful. Thank you! I have read the discussions but have not seen an answer to my question which may be because the premise to my question is incorrect. I have a business in Texas (origin based). We sell a software package to companies in several states (mostly destination based). I have determined that we have nexus in most of the states because of the time our sales force spends soliciting business in the states. Regardless, for the purpose of my question please assume I have nexus in all states referenced. If I sell to a company located in Georgia (destination based state) and I have determined that I have Nexus in Georgia do I have to charge the Georgia destination based sales tax rate or the Texas Origin based rate? If Texas wants me to collect based on where I ship from in Texas and Georgia wants me to collect on where I ship to in Georgia, doesn’t that mean that two states expect me to collect sales tax? great question! In this specific case, (you are a remote seller, selling to another state where you have nexus) you almost always charge based on the ship to location’s rate. (I only say almost always because AZ, NM and CA have some weird quirks about this.) So in your case, you’d charge the customer’s ship to location in Georgia. I hope this helps! Here’s a good one. I’m in WA, a “destination sales tax” state. A customer in Oregon (no sales tax) wants to drive up here and pick up their purchase at our location in WA. I’m thinking we will have to charge them sales tax at our local rate, even though they will immediately drive the merchandise home to Oregon? Your thoughts? Great question! You normally charge sales tax at the ship to address, so in this case it sounds like you wouldn’t charge sales tax. That was quick. Thanks so much. Most of what I sell is a service and not taxable in MA so with this one product, I wasn’t sure. We are launching an online marketplace (similar to Amazon, but in a very small scale) later this month. We have sellers that would sell from various states to any where in the country. I assume that our sellers would collect sales tax for the products they sell. However, given our current situation we have decided to re-sell products ourselves until we have enough sellers on-board. I highly recommend you contact a sales tax expert on this question. Sylvia Dion (www.sylviadioncpa.com) is a great one for international sales tax matters. One final thought – this one can get complicated, because your sellers are going to have to collect sales tax and you’ll need to give them a way to charge sales tax. One way is use TaxJar’s SmartCalcs sales tax API for Marketplaces (www.taxjar.com/marketplaces). But it’s best to get your liability issues settled first to find out what exactly you need to do. Good luck with your new marketplace! Hi, I am a distribitor of promotional marketing goods. My business location is in Florida and one of my customers is in California. My supplier (also located in California) where i purchased my goods for resale, has charged me California sales tax because they shipped them directly to my customer in California. If they would have shipped them to any other state I would not have been charged sales tax.. Should I be charged the California sales tax being out of state? From my understanding, I am the reseller so I should not get taxed.. Please advise. Thank you in advance for your time! This depends on a few things. The company is supposed to charge sales tax based on the ship to address, so unless they had a reseller certificate from you, they probably saw themselves as required to charge sales tax. To complicate matters, California is one of a few states that doesn’t accept out of state resale certificates. Keep in mind that this is just my understanding, but it look like they were in the right to charge on this occasion. That said, for a concrete answer and any steps you can take, I recommend contacting a sales tax expert: http://www.taxjar.com/sales-tax-accountant-directory/ You can also contact the California BOE: https://blog.taxjar.com/state-sales-tax-phone-numbers/ I hope this has at least pointed you in the right direction! Mark, your example for out of state seller might be a little misleading and potentially wrong especially as it pertains to Illinois. The reason I know this is that I am presently going through a sales tax audit with the state of Illinois. We have 2 outside salespeople that live in Illinois for our company. These salespeople don’t do more than 3 of the 5 composite selling activities that Illinois defines for retailers. Thus based on Illinois’s definition of a retailer in their state, when we ship product into the state of Illinois from our plants in either Wi or MN we are only to collect the Illinois state “USE” tax rate which is 6.25%. We are not to collect sales tax based on destination of the product into Illinois. That is what we had been doing. At least we were over collecting rather than under collecting. Thanks for your reply on this one! I’ll change the example. And you’re right, some states are nice in that they allow out of state sellers to pay one flat rate in use tax. I live in WI and sell my jewelry online. My confusion is what am I required to charge out of state buyer? I know we are a destination state. Is that all i charge? Also where can if find a listing of the state amounts? I hope you can help me as much as you’ve helped others on here with your articles and Q&A. We have a company based in Canada and about a year ago we started a new US branch registered to the Department of state and with a nexus in our home state Berks, PA. Since the US branch is a separate entity, should i charge sales or use tax to out of state buyers, or only to buyers in Pennsylvania? (we have no other sales nexus) Also, can i charge a flat rate of 6% (PA sales tax) or i am considered a remote seller and need to apply the destination based laws? You’d register for a permit and charge sales tax in any state where you have sales tax nexus. So if you only have nexus in PA, only charge sales tax in PA. If you live in PA, you’d charge based on the total combined sales tax rate at your location (since PA is origin-based for in-state sellers.) I hope this helps!